Story: Since I am unable to pick a topic for the story, this post shall be called "dumb shows, smart recipes and lovely friends". What are dumb shows you ask? - here's an example - Semi-Homemade Cooking with Sandra Lee. why - well - first of all, there is very little skill involved in teaching how to read instructions on a store-bought ready-to-cook tin.. and then the show becomes even dumber when you spend half the time on making a matching table setting. there is a reason I don't watch Martha Stuart and watch food network instead....sigh! Let's talk about Smart Recipes - recipes that give you amazing results in a fraction of time it takes to make the same dish from scratch. For example, using Gits rabdi mix to make the malai and adding store-bought rasgullas to the boiling mixture to get delicious ras malai. Now about lovely friends!! - that's what the picture is all about.. I have been away from the blog for quite some time and my amazing friends are always encouraging me to keep posting. By either asking me about the blog or by asking me for a recipe.. Here you go Vish & Smita :-) I will wait for the dessert delivery this weekend. Recipe: Follow the instructions on the Gits rabdi mix packet - but add double the milk than specified on the packet. Add saffron strands to the mixture. Heat the mixture on the stove while constantly stirring and bring to a boil. Turn the heat low. Let the mixture simmer for 2-3 minutes on low heat with the rasgullas and then turn the heat off. 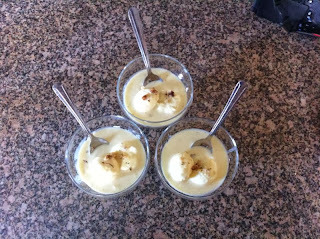 Keep the rasmalai covered for 3-4 hours at least - overnight is even better. Cool it in the fridge before serving. When served, these tend to disappear before one can click a picture - Vish - I am counting on you to click one for the blog. Update: Vish sent a picture and the awesome Ras Malai!! delicious :-) thanks.